In 2004, Heather Watson Hardie founded the Greenwich Suzuki Academy. 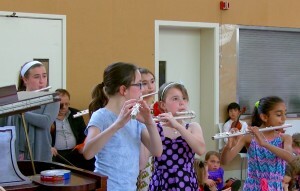 She had noticed an interest in the community for establishing a serious arts program geared toward musical development. In Heather’s vision, the program should incorporate not only the highest quality of musical instruction, but should seek the most thoroughly trained and highly skilled teaching staff geared toward enriching the lives of children and their families through music. In her studies of the Suzuki method, Heather found a philosophy of teaching that infuses musical instruction with a positive learning environment while seeking to enhance the relationship between the parent, child, and teacher. Dr. Shinichi Suzuki, for whom the method is named, cared about the development of the individual as much as the individual’s musical development. See The Suzuki Method for more on this. The school has grown ten fold since its humble beginnings and now boasts 10 outstanding faculty members and over 150 students. Our students have participated in Connecticut All-State and All-Region Ensembles and won numerous competitions and awards in Connecticut, New York, and New Jersey. You can see our students participating in the New York Youth Symphony, Norwalk Youth Symphony, the Stamford young artists program, and many of the public and private school ensembles in our area. Our students have also been selected multiple times to perform in the S.A.A. Biennial Conference from an international pool of applicants. Our faculty often spends a portion of their summers teaching in some of the countries top Suzuki Institutes which has included those in Chicago, Colorado, Hartford, Boston (Suzuki Flute Institute), New York (School for Strings Institute), and even South-central Alaska! During the summer our students can frequently be found attending the Suzuki Institutes of Chicago, Colorado, Ithaca, and Hartford and have also attended summer festivals at Interlochen, Apple Hill, Brevard, and the David Einfeldt Chamber Music Seminar at Hartt.